It’s no secret that even the best blockbusters can be rather insubstantial affairs. Their saving grace is that are usually adept at providing the requisite action and thrills, often because the massive production budgets allow for such things. Well, times must and always do change. Just as the western and the musical completely fell out of favor long ago, so too will big blockbusters one day go the way of the dodo. Lower budgeted films may one day begin to dominate the market place for a time, just as they did after the collapse of the big studio system. Fear not, fellow adrenaline junkies, for we will still be able to get our collective fix. A new generation of filmmakers seems capable of delivering the goods at only a fraction of the cost. What else would explain the existence of a modest budgeted thriller like Nicolas Winding Refn’s Drive. 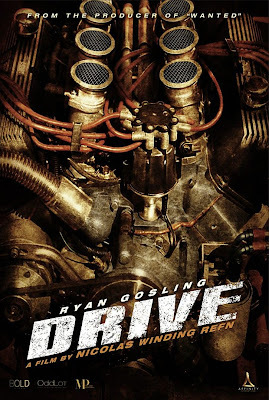 Drive tells the story of a Hollywood stunt driver (Ryan Gosling) who supplements his income by acting as getaway driver. His mentor Shannon (Bryan Cranston) acts as his manager in both the legitimate world and the underworld. Shannon convinces his friend Bernie Rose (Albert Rose) to act as a benefactor for their little operation. Impressed by Driver’s abilities behind the wheel, Bernie soon pairs the young prodigy with Nino (Ron Perlman). Shortly thereafter, Driver falls for a waitress named Irene (Carey Mulligan) and takes to her young son Benecio (Kaden Leos). When Irene’s husband Standard (Isaac Guzman) is released from prison, Driver falls back out of respect. However, tragic circumstances soon place him back to Irene’s side and put a price on his head. Drive is based on the novel of the same name by James Sallis. Academy Award nominated screenwriter Hossein Amini overcame considerable difficulties in adapting the novella’s nonlinear narrative for the big screen. When that arduous task was completed, Nicolas Winding Refn eventually inherited the director’s cap. The cast is an eclectic but appealing mix that includes Albert Brooks, Bryan Craxton, and Ron Pearlman. Though the film is officially budgeted at only 13 million dollars, it looks as though it could have cost five times as much. It has the feel of slick, empty headed populist fare such as Fast Five. Yet there appears to be much more going on beneath the hood. From a character and plot standpoint, the film appears to play more like a slick modern day noir replete with love triangles, surrogate father figures and makeshift family units. If Drive represents a possible future for action cinema, than consider me sold. *Thanks to IGN for the scoop.